What’s more exciting than getting to preview new tanning lotions at your favorite sun spa shop? How about a 100% rebate in Blue Bucks with each purchase? When a shipment of new lotions arrives at any of our locations around Hampton Roads, it’s like Christmas came early, and we’re thrilled to show off new products from Ed Hardy and Devoted Creations. 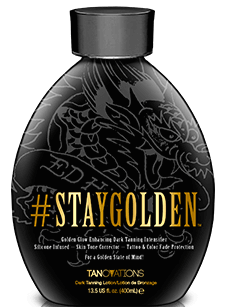 #StayGolden from Ed Hardy is a DHA free intensifer combining four tan activators, color correctors and detoxifying agents. Featuring white charcoal to unclog pores, white birch for eczema, and phloritan for anti-reddening. White 2 Black / Violet from Devoted Creations is a high DHA bronzer with purple tones to counteract orange tones. It’s perfect for any skin type, even the fairest of complexions. We’re so excited about having these new lotions in our spa shops that club member discounts will apply when you purchase. If you’re not a current club member, you can join now and receive your 10-30% discount when you purchase any lotion. To learn more about our membership options, visit the membership plan page or contact us online or at any locations. Winter is coming, and this is the time to come in and stay warm and keep your gorgeous color.